Here is the high level architecture of the program, in comprises of a Brain and Client solution with a built in State Engine. The inline messenger you see within the Dolly page which the user interacts with (We call this the Client) is just an interface that is in the same domain as the Brain and is embedded in an iframe inside the Dolly site. Everything the user does using the Client silently triggers functions on the Brain (using the standard Child – Parent relationship that exists) which do all the hard work. So if the user clicks on a contact and starts a conversation on the Client, the same actions are being done on the brain (but hidden from the user) and when the Brain receives communication from the API, it triggers interface events on the Client to mirror the updates. 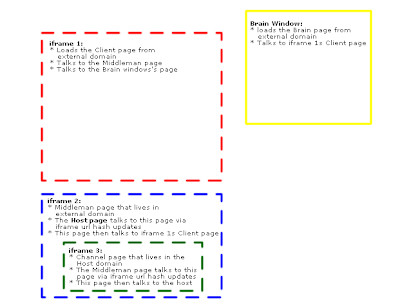 In this example, this structure of iframes and windows which host pages from 2 domains (Dolly which acts as the host domain and has the Channel page and the iframes, and an external domain that has the Brain, Client, Middleman etc) work together to authenticate cross domain requests and maintain a flow of communication that works across page loads and domains. This is basically the high level design, we also have 4 site dependent cookies (2 on the host domain and 2 on the external domain) to authenticate users, provide custom skins for sites provide tracking etc. In Java, you solve the cookie problem with a persistence bean.